There are a few different varieties of Korean fish sauce. Korean anchovy sauce (Mulch Aecjeot, 멸치액젓), Sand lance sauce (Kkanari Aecjeot, 까나리 액젓) and salted fermented shrimp sauce (Saeujeot, 새우젓). 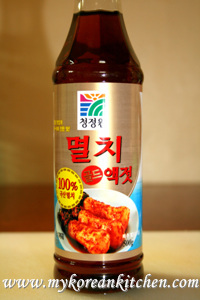 Korean fish sauce is typically used in Kimchi making to accelerate the fermentation process. 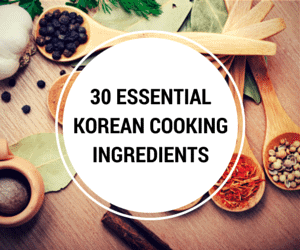 On some occasions, it is also used in Korean side dishes and soup/stew to give extra umami. This is the picture of anchovy sauce I normally use. Anchovy sauce is made of fermented and simmered anchovies and it is a light brown liquid. Update: Please refer below to Chris’ comment (Mar 20, 2007), which contrasts the Korean anchovy sauce with other kinds of anchovy sauce (e.g. Thai fish sauce). I cannot verify whether the information is correct or not, however, it might give you some sort of guidance when you are choosing one. 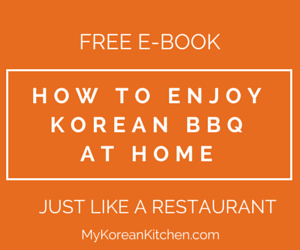 Korean anchovy sauce is actually an active fermentation agent. In the old days, you pounded what were essentially slightly old and basically raw anchovies or certain kinds of squid (there are regional variations), and then you tossed this in with the vegetables. At a fairly cool temperature, in the dark, the combination of salt, hot chili powder, vegetable sugar, and the seafood would produce fermentation. Then, four months later or so, you dig up your pot of kimchi and it’s great. This is why kimchi keeps a long time and is tingly on the tongue. (Incidentally a variation on the same process creates sauerkraut.) 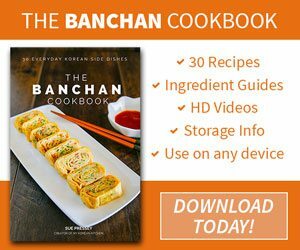 Korean anchovy sauce is a modern derivative that is more stable and consistent than actual raw anchovies, and requires less careful handling. It does have a distinctive taste, but it’s not really “sauce” in that sense at all. By contrast, Thai fish sauce is made from fermented fish, and the process is artificially stopped at the end. So it’s sort of like opposite ends of a process: anchovy sauce, once well fermented and so forth, turns into something like fish sauce. But fish sauce will not cause controlled fermentation, and it most definitely doesn’t taste the same. Good luck. Fortunately, if you’re into Korean food, you can mail-order anchovy sauce easily, and it keeps forever. Such a nice cotrast, Chris! Thanks very much for the info. You are right. I have my Kimchi made for me by a Korean Chef. Her secret ingredient is anchovies that are smashed. This might be splitting hairs, what about Vietnamese anchovy sauce? It looks kinda skanky though…. I am not really sure if Thai or Vietnamese fish sauce are the same as Korean fish sauce. I’ve never bought any. Can I use Thai/Vietnamese fish sauce instead?